Cindy unveils a new series of Art Nouveau inspired beads. In French it's known as "Stile Floreal" and in English it's the "Floral Style." Check out this unusual call for entries the Crafty Princess found for Momiji doll lovers. Lorelei is hosting a Necklace Round Robin, but you have to leave a comment to be entered to win a spot! Beadfest Philadelphia was packed with talented artisans and bead-makers. See what Andrew picked out! Have you ever used sterling silver curly-Q tubes in your jewelry designs?? Lisa is searching for cool ideas for these adorable tubes. 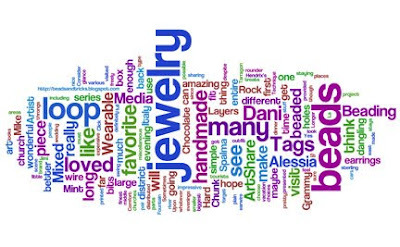 Do you use blogging to promote your jewelry business? Tammy has some thoughts for you on this. Art Bead Scene expands the editorial staff and welcomes Lorelei Eurto! Carmi uses shrink plastic to make a neat little bracelet.